It was the trailer for Who Killed Captain Alex? billed as Uganda's first action movie. The minute-long video showed bloody gun battles, speeded-up kung fu fights and computer-generated helicopters bombing Kampala. If you looked closely, you could see that the machine guns - replicas of Rambo's M60 - had been welded from scrap metal, and the bullets carved from wood. Much of the action took place in mud. A high-pitched voiceover announced this was the work of Ramon Productions, and gave a phone number. The clip had an electrifying effect on Hofmanis. "Around 40 seconds into it, I decided: I'm coming to Uganda," he says. "I realised what I'm looking at makes no sense - but it's complete genius." As programme director for the Lake Placid Film Festival, Hofmanis was used to spotting emerging talent, but he says what he saw here was "off the charts" in its ambition. "In the West, when you have no money, you shoot two people having a conversation… You don't make a war film." Two weeks later he travelled to Uganda. He didn't bother to call ahead, his mind was made up. On his first day in Kampala he was at a busy market, when, far in the distance, he spotted a man wearing a T-shirt that said Ramon Film Productions. He immediately gave chase. "I just start running, and I'm chasing him… so he starts running, but we eventually catch up, and we calm down, and I say: 'Look, I'm just a fan from New York City - can you take me to the film-maker?'" The answer was, "Yes," so Hofmanis jumped on the back of a motorcycle and 30 minutes later arrived in Wakaliga, a slum on the outskirts of Kampala. "There are goats everywhere, there are chickens everywhere… That's raw sewage that's going right in front of the house - and that actually plays a major role in the films, because it's life here - it's dust, it's heat, it's children, it's animals… and it's pure joy," he says. Isaac Nabwana, the film director and brains behind Ramon Productions, was not fazed by the unexpected arrival. "I asked him, why didn't he call me? He said: 'I am a friend, I had to reach you.' That's when I realised that he's a true friend," he says. Nabwana offered his visitor some tea, and they spoke for five hours. The volunteer cast and crew source props wherever they can. The green screen is a piece of cloth bought at the market, draped over a wall. The camera crane is made from spare tractor parts - Dauda Bissaso, one of the regular actors, is a mechanic and builds all the heavy gear and weapons. "He's just a genius with a blowtorch, he makes everything," says Hofmanis. Another key member of the team is Bruce U, a Bruce Lee fan who choreographs the fight scenes and runs a kung fu school for the children of Wakaliga. Fake blood is needed in vast quantities because the films are violent - but in a cartoonish way, and quite unlike the real violence Nabwana witnessed growing up during Uganda's 1981-86 civil war. "I don't put that in my movies, what I saw in the past," he says. "I include comedy - there was no comedy in the violence which I witnessed." His cinematic hero is Chuck Norris, although he also likes Rambo and The Expendables. Hofmanis, on the other hand, compares him to directors like Guillermo del Toro, Robert Rodriguez and Martin Scorsese - "in terms of creativity and what they're contributing to cinema". Nabwana's love for films began long before he was allowed to watch any - his older brother Kizito would return from the local cinema hall and describe what he'd seen in vivid detail. "I remember the gestures he used… there was a guy who used to crush people, so I liked that," says Nabwana. "Even now I see them in my head." As soon as they met, Nabwana agreed to write a role for Hofmanis, who felt like he was 10 years old again. "When I was a child, I would go through my father's closet, find two belts of his, tie them together, and now I'm Indiana Jones. And the trees are Nazis. That's what this is," he says. 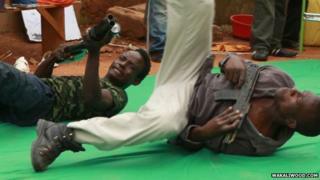 So, two days after arriving in Uganda, he found himself filming a fight scene. It didn't quite go to plan. "I grab someone in the scene and we fall into the raw sewage and we start fighting there." He says everyone was amazed to see an American rolling around in sewage. "That in some ways was my baptism here. Only people who are from the slums behave this way - because they grow up with sewage it doesn't mean much to them." They honoured him with a Ugandan name: Ssali. Sewage plays a part in all of Nabwana's movies. He purposely includes such details because he wants to reflect his surroundings - his films are from the slums, by the slum. It's part of their appeal. "What I've found out… is that people want to see what they live in. They want their life to be put on DVD. They like it very much," he says. "I'm going to show the world the kind of life we enjoy or we grew up in," Nabwana said in an interview for the 2012 documentary Wakaliwood. "It's called a ghetto life but you know it's good… and it's hostile." After that first trip in December 2011, Hofmanis visited six more times. Then in March 2014, the 45-year-old sold his possessions and moved to Wakaliga. "Back in New York I got rid of everything. I had put my stuff in storage but I couldn't even afford the $22 (£14) per month it cost," he says. "I'm all in." "He's now part of my family," says Nabwana, 42, who lives with his wife Harriet and three children. Hofmanis moved in next door. The team spend a lot of time discussing weapons. Nabwana now plans to build a full-scale helicopter from scrap. He has a fondness for choppers, and remembers being chased by one during the civil war when he was about 12 years old. His brother's cinematic knowledge kicked in and they tried to outrun it - the helicopter followed. He chuckles at the memory. Wakaliwood currently has six films in production, including Bad Black, a kind of reverse Karate Kid, starring the children of Wakaliga. And they are inviting fans from around the world to submit scenes for "the world's first crowd-sourced action film" - called Tebaatusasula: EBOLA. Hofmanis describes life in Wakaliwood as a "lazy country afternoon punctuated by the unpredictable". As one of the few white men around, he's in demand as an actor. He has played Jesus in a chart-topping music video. For another role he had to crawl into a fresh goat's carcass "so when the cannibals plunge a knife into my chest they're pulling out the goat's intestines and not my own." "But that's the whole point. Wakaliwood should not be able to do what it does. But it's happening. But in the end, it may be Hofmanis' story that attracts Hollywood's attention. Emmie wanted to be a VJ from the age of six, because he realised it would make him popular. "I went to the cinema hall and watched this guy translating a movie and the first benches around him - it was women. When I went back home I told my mother, 'I want to be a VJ' - mother wanted me to be a tailor."